Houthis stole food ‘from the mouths’ of hungry Yemenis: UN…. The UN’s food agency has accused Houthi rebels of stealing food “from the mouths” of hungry Yemenis, hours after an investigation by the Associated Press (AP) news agency found that both sides in the conflict had stolen aid meant for the country’s most vulnerable. David Beasley, the Executive Director of the World Food Programme (WFP), said on Monday that his agency had collected evidence showing the Houthis had diverted shipments of food sent to help alleviate “the world’s worst humanitarian crisis”. “At a time when children are dying in Yemen because they haven’t enough food to eat, that is an outrage,” Beasley said. “This criminal behaviour must stop immediately”. Yemen’s four-year war and ensuing economic collapse have unleashed the world’s most urgent humanitarian crisis with more than 22 million people needing some kind of aid to survive. Food prices have increased by an average of 68 percent, and the price of commodities such as petrol, diesel and cooking gas has increased by at least 25 percent in the past year. The WFP said the photographic and other evidence it had obtained showed trucks illicitly removing food from designated food distribution centres and local officials falsifying records and manipulating the selection of beneficiaries. It accused one local partner organisation affiliated with the Houthi Ministry of Education of committing fraud and said humanitarian food was being sold on the open market in Sanaa. “This conduct amounts to the stealing of food from the mouths of hungry people,” Beasley said. Al Jazeera reached out to Houthi officials for comment but did not receive a response at the time of publication. The WFP’s damning assessment came just hours after the AP reported that, along with the Houthis, forces loyal to the Yemeni government had siphoned off aid meant for thousands of families residing in the besieged city of Taiz. “The army that should protect the aid is looting the aid,” Nabil al-Hakimi, a humanitarian official in Taiz, one of Yemen’s largest cities told the AP. Al-Hakimi said that local militias, who had been absorbed into Yemen’s national armed forces but competed with each other to maintain their presence in sectors of the city that they control, were keeping aid for themselves. “The only means to achieve anyone’s goals is through weapons,” he told the AP. Yemen has been wracked by violence since 2014 when the Houthis stormed south from their stronghold of Saada and overran much of the country, including the capital Sanaa where they overthrew the government of President Abd-Rabbu Mansour Hadi. The conflict escalated in 2015 when Saudi Arabia and the UAE, who accuse the Houthis of being Iranian proxies, formed a coalition that launched a massive air campaign aimed at reinstating Hadi’s government. With logistical support from the US, the coalition has carried out more than 18,000 raids on Houthi-held areas in an attempt to reverse their gains. 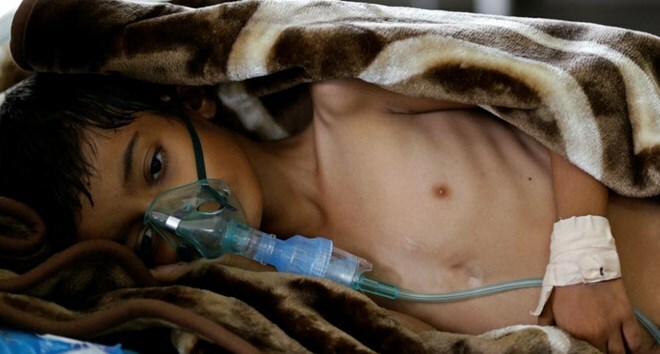 According to recent estimates, as many as 85,000 children may have died from hunger since the coalition’s intervention. Abdullah al-Hamidi, who served as acting education minister in the Houthi-run government before defecting to the Saudi-UAE coalition, told the AP: “since the Houthis came to power, looting has been on a large scale”. “This is why the poor get nothing. What really arrives to people is very little”.